Entertainment Industry – Page 3 – Unfake It 'till you make it! Had the honor and privilege to take my mom and me to see the beautiful performance of Shen Yun this year. We enjoyed it! Check out this ‘editor’s picks’ interview in The Epoch Times featuring my experience. The Epoch Times Interviews Tony Suriano Whether you’re a filmmaker, artist, or just a human that wants to get inspired by organized eye candy, Shen Yun was worth it. Every single thing or event can make an imprint on our lives. I’m sure this experience will carry over into my next project for sure. TICKET BUYING HACK: These tickets were pricey ($100+/per seat closer to back! ), so I bought them ahead of time. Sure it saved a little money but the real hack was the research I did on theater size. Nearly all the theaters in Los Angeles County and surrounding areas have huge 3000 plus seating. All but one. Palm Dessert theater has 1000 seats. This smaller venue allowed me to get twice as close to the performance for the same price. Yeah, I felt great about that. And yeah, I made my mom’s FB cover photo. Tony 1, Sisters 0. Richard Baratta is one of the Executive Producers for Martin Scorsese’s film, The Irishman. We get into all that as well as his in-depth insights and his outlook on the industry. Richard has over 40 IMDB credits and has produced and worked on many of my favorite films like Last Action Hero with Arnold Schwarzenegger and Donnie Brosco with Johnny Depp. He worked on the Spiderman movies and he even co-produced The Wolf of Wall Street which is incredible. Please enjoy, listen, and learn as I did. [42:10] If you have a script?it’s a tuff business! This episode is all about sound in the entertainment industry. My guest, Mr. Blake Allen Donaubauer (B.A.D) is a professional Audio Mixer for TV and Film with a lot of set experience and a huge musical background. He started as a Production Assistant in Los Angeles for some years, which allowed him to transition into a career of sound, establishing himself in New Orleans. We talk gear and we talk about how he stayed humble through the entry-level gigs while steadily climbing the ladder toward his passions. [21:00] Blakes’s experience at Berkley College Of Music. Song writing Major, Film scoring. [50:30] BE AWARE of what loud noises that may occur on set. Ask so you don’t kill your ears! [55:15] Blake first audio mixing gig (throwing up; Take jobs you are not really qualified to do but know you can get through. [1:09:30] What type of person is a good fit for the audio world? [1::00] When times are tuff financially in the film industry. Getting the next gig. [1:32:10] Sound resources, gear and tutorials at www.Trewaudio.com, Facebook Freelance sound mixers page.Sound Devices Page, Electronics Customer service is great! [What do you want written on your epitaph? [1:46:00] Blake’s last words about the film industry and its intricacies about it. The work that goes into the work is work. If you like the show, please subscribe! [5:30] Joseph is preparing for a new New Short Film in between running his film studio. Sleep with Rocket Ships[28:00] As a refugee in Austria, Joseph shot his first feature film, The Tune Of Nolstagia with his fellow refugees. [60:00] ONE STEP at a time or you will fall fast. Be the best at whatever level you are at. Danny Meyer is a working bandleader, jazz, blues and soul singer, guitarist, bassist, and teacher who not only performs live as a bandleader all over Los Angeles but also creates music for Film & TV. He is a major contributor to the art community with such endeavors like creating affordable music lockouts as well as artist complexes. In this episode, we talk about creating your own gig, various ways to earn money as a musician, and unique confidence strategies. Please enjoy! [15:00] Danny’s first paid music gig! [24:43] Creating your own gigs! Add to the community! [45:00] Danny’s original song he sang, Kick the Cable. Listen below! [126:20] Danny keeps his live gear set ups simple; the more gear you have the more problems that can come up. My guest today is a young woman who wears many hats, some include her as an Author of three beautiful children’s books (she reads them to kids across the nation), a teacher for over 16 years, an actress, a spiritual psychologist, and probably the most difficult job of all, a Mom. We had a lotta fun and got into how to get out of depression within creativity as well as how to get vulnerable. I am proud to have her on the show! please enjoy my interview with Miss Gina Ann. [12:00] Being a kid and losing track of time. [36:00] Tony gets on a tangent about boiling cats! [39:45] When people think they are not creative. Tony’s working on a Book about creativity. [50:15] When we are in a great mood THAT is the time to add reminders that inspire you in your life. You will thank yourself later when you are in “give up” mode. [45:00] Making money through your passion or to support your passion. www.audiojungle.com is a place to submit and earn money from high-quality music recordings you may be making. [47:50] Finding a flexible “outside” job is imperative as an Actor. And you must bring your best self to that job just like the audition. Don’t be disgruntled! [108:56] Before you spend money and time really think it through…why are you doing this? [111:50] Don’t be afraid of someone stealing your ideas. In this episode, I interview a mindful man with multiple businesses in the magical world of cinema. If you love the camera, film sets, and tech talk as I do, we get into all of those things. He is also a phenomenal Director of Photography in the feature film and commercial world. We also explore how breaking his leg in 5 places was a good thing, and why actively taking a pause throughout the day can save you a lot of trouble. 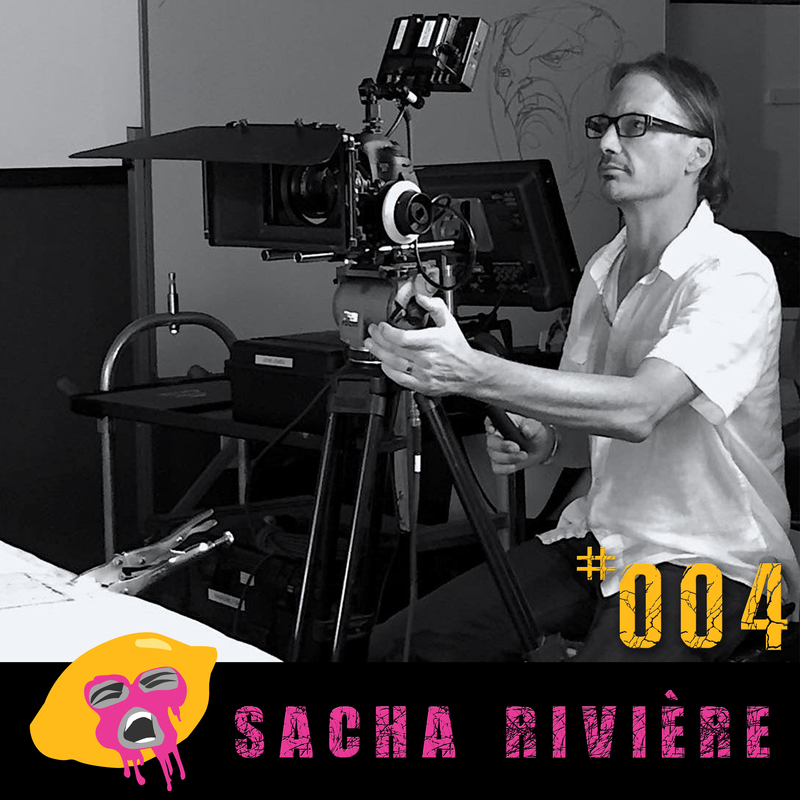 Please enjoy a rewarding conversation with one of my dear friends and colleagues who is also one of my much-appreciated mentors, Mr. Sacha Riviére. If you get in as a Production Assistant, always ask ask ask to work in the department you’re interested in. [16:00] Shooting on film. Challenges and inner sense. Tech stuff. [19:30] Blocking – Moving Camera and Actors. Cast and crew should know how the scenes are blocked because everyone can do there best and keep good time. [20:28] Going with your gut and SPEAKING UP. People may not like your mistakes but you’ll get respect by admitting them. They will find out soon enough anyway, might as well be the one tell them. [21:55] Transition from AC to Cameraman and declining gigs. [24:00] Morning Routine. Preparing and reminding yourself to pause. Look out for the cues! Mindfulness in Filmmaking. [32:00] Sacha’s process of shooting a film, start to finish. [38:20] Working with the Director and understand their vision. [47:00] Dealing with Giving up mentality. Look at different choices and count how many things you have tried. [50:45] What type of person is fit for the film industry? [53:15] ZOOMING out and getting a GRIP. Under pressure and high expectations, remember what you’re doing is not life and death. [56:00] Mistakes and oversleeping! It happens, but be aware that being late could be a subconscious way of trying taking control because something in your life is out of control. [1:02:30] One step Sacha recommends is to take chances and be willing to ask for help. If you found some gold in this episode, please subscribe and share! [00:50] Tony talks about Martin Scorsese’s The Irishman Wrap Party in New York. You can’t judge why people do what they do and if you remember that, it’s a great help when shooting documentaries. When you make peace with how people are as individuals, it makes everything more of a pleasurable environment. [39:19] In one word what are you trying to improve on the most? [42:00] What one step can people take to further their career in the entertainment industry? In this episode, I interview a working actor and entrepreneur in Los Angeles who has created over 170 side Vlogs involving absurd skits filmed in locations throughout California. He is also one of the top Cyclists in Los Angeles and we get into a little bit about how that plays a meditational role in his life. We talk about acting in the film industry, the benefits of suffering, and how labeling one’s self as sole “this” or “that” can be damaging. We have some laughs, Shane makes fun of me, and I hope you enjoy my conversation with one of my best mates, Mr. Citizen Shane. [5:22] Traveling the world inspired Shane’s 170+ Vlog videos. Travel TIP: Checkout www.onebag.com for tips on how to travel light, effectively, and efficiently. It helped prepared my travels of a year in southeast Asia and all over the US. And if you’re interested traveling while working remotely, see Tim Ferriss’s website www.thefourhourworkweek.com or get his book, a bible to the New Rich like me, The Four Hour Work Week. And you can grab it on Amazon here http://amzn.to/2HL9iKL . He has been a major contributor/inspiration to my business and personal endeavors. [20:20] Beyond Acting – Even though Shane feels writing isn’t his strong point, he says by giving writing a try more and more, he has found it to help him grow all around as a filmmaker. [23:00] Who is a good fit? Be willing to learn and push your limits. There is a job in the entertainment industry for every type of person. [26:00] Avoiding Mistakes – Giving up is always a mistake when it is something you love to do. Thinking that you can’t practice Acting and do other things at the same time is a limited mind set. Utilize Internet as an entertainer- Do what you love and do it for yourself first, then take advantage of todays possibilities?you can access 7 billion people through the internet! [31:30] The Irishman – A Martin Scorsese film I have an acting part in coming out rumors November 2018 on Netflix. [36:00] Staying real as an Actor “If you can’t be yourself, you can’t go anywhere” Be yourself to the max, it’s a practice.